Ayurveda uses nature’s remedies to target the root cause of imbalance and not the symptoms. Keeping in line with this ancient philosophy, Anammyaa Wellness has blended natural herbs into a unique product that aims to simultaneously cure the imbalances in a person’s Prakriti and provide the necessary strength to ensure body immunity levels are maintained at optimal levels. 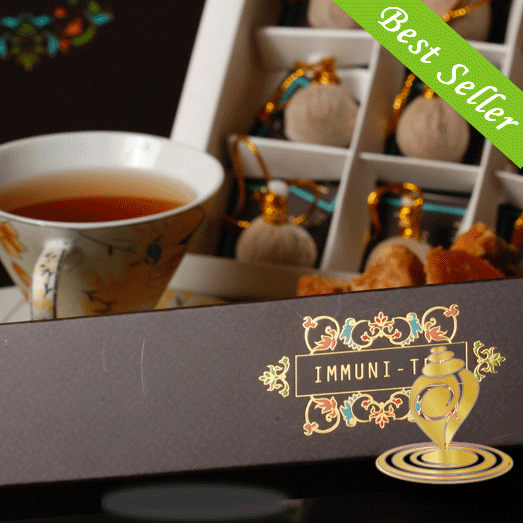 Immune-Tea is meant to enhance your immunity levels so that the body can fight free radicals at all times. The product composition includes Elaichi (Cardamom) which has minerals such as niacin, pyridoxine, riboflavin, thiamin, phosphorus etc… KaaliMirch (Black Pepper) rich in expectorant properties and has manganese, copper, magnesium, calcium etc… ; Pippali (Piper Longum) powerful stimulant for digestive & respiratory systems; Sounth (Dry Ginger) is hot in potency which balances kapha dosha; Loung (Cloves) a rich source of minerals such as calcium, iron, magnesium, phosphorous, potassium, sodium, & zinc and vitamins such as vitamin C, thiamin, riboflavin, niacin, folate, vitamin B6, vitamin B12, vitamin A, vitamin E, vitamin D, and vitamin K. Certain bioactive compounds have been isolated from clove extracts. Dalchini (Cinnamon) very rich in magnesium & calcium and Gud (Jaggery) loaded with minerals and antioxidants such as zinc and selenium prevents free radicals. Boil one sachet &amp; some jiggery (as per taste) in water for 5 minutes and drink. The contents in sachet can also be added in tea preparation and had as regular tea mix flavor. Anammyaa wellness Immune-Tea detoxifies the body and fights free radicals while balancing the Prakriti to its intended levels. Prevents weather related allergies, chronic cough &amp; cold; relieves upper respiratory infections, helps in immunity building &amp; internal inflammation, eases asthma &amp; throat disorders, rejuvenates &amp; purifies the lungs, breaks up phlegm deposits in the respiratory tract and helps in expelling the deposits. The tea also helps in removing toxic build up from cell walls arteries, and tissues to reduce excess body weight. The medicated oils for hair &amp; skin, vegetable &amp; fruit scrubs, face &amp; hair packs and other rational medicinal formulations for physical &amp; oral administration are traditionally created &amp; developed with care &amp; attention at Anammyaa Wellness under the supervision of experienced Ayurveda Vaidyas.